Jonathan Grant Thompson, the man behind the popular science-focused YouTube channel, The King of Random. 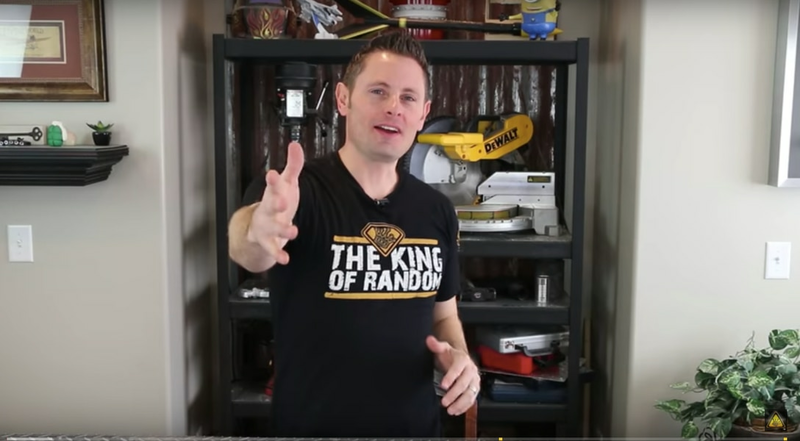 The man behind the popular science-focused YouTube channel King of Random has been charged with two counts of second-degree felony possession of an explosive device for allegedly conducting incendiary experiments in his backyard. Jonathan Grant Thompson, of South Jordan, was charged Tuesday for two separate events involving an explosive. He was not arrested. An initial court appearance has been set for Feb. 21 in West Jordan’s 3rd District Court, according to the court docket, which says a summons will be issued. When reached by phone Wednesday afternoon, Thompson said he had heard about the charges from media and fans on Twitter. He was upset and confused about the allegations. “It makes it seem like I am a irresponsible YouTuber who is blowing stuff up,” he said. While Thompson’s channel does include some videos with explosions or fire, there are also many others that show how to do things like making a rope out of a soda bottle or making a silicone mold of a chicken. His most popular video, with 26 million views, shows how to make gummy candy in the shape of Legos. Thompson, 37, runs the King of Random YouTube channel, boasting about 200 videos and 8.9 million subscribers. His videos are of science experiments and are in the vein of science-based shows on networks such as the Discovery Channel. Thompson has been making videos and putting them on YouTube since 2010. His videos have garnered more than 1.6 billion combined views. According to a probable cause statement written by a South Jordan police officer, the first count resulted from a citizen complaint via Facebook Messenger on June 15 about Thompson exploding a dry ice bomb. The video (seen below) was uploaded June 13, according to the police report. The video is titled “Don’t Put Dry Ice In A Coke Bottle! !” and it includes a large disclaimer saying to not try the experiment. Then, on Aug. 27, police responded to Thompson’s South Jordan home on a report of an explosion, the police report states. Thompson told them he has a YouTube channel where he posts his science experiments, including some with explosions. Thompson said a friend had left him a bag of powder, which he believed to be from a deconstructed firework. After lighting a couple of small “control fires” Thompson and Timothy Burgess, 20, of Ontario, Canada, ignited a larger pile which exploded, the police report states. According to the report, firefighters heard the explosion from the nearby fire station. Google Maps shows there is a South Jordan fire station 0.2 miles from Thompson’s home. The explosion left Burgess with small particles of burned material embedded in his arms, charges say. Burgess was charged with one count of second-degree felony possession of an explosive device. Court records show prosecutors have asked a judge to issue a $15,000 warrant for his arrest. Thompson told The Tribune that local police and fire were aware of his experiments and had watched his YouTube channel. A receptionist with the South Jordan Police Department said Wednesday there were no officers available who could speak about the events. South Jordan Fire Department Battalion Chief Mike Richards said he wasn’t aware of Thompson, but said others in the department might be. Blake Nakamura, chief deputy district attorney for Salt Lake County, where the men are being prosecuted, said in general it is up to the prosecutor to decide whether an incident like this is a crime. Nakamura said state statute does not allow people to possess explosives unless they are exempt personnel, such as police or military. A license issued by the state fire marshal can also exempt someone from criminal prosecution, but a representative of the fire marshal’s office said that is only used for public fireworks displays. While the statute doesn’t define a lawful business, Thompson most certainly receives revenue as a result of his videos. In addition to the millions of views, he has a website selling merchandise, which is linked on his YouTube page and offers shirts, hats, rings and other items. Nakamura said his office hasn’t investigated the legality of the business, but if Thompson’s attorney challenged the case on those merits, prosecutors would look to see if King of Random is a licensed business, operating in an area that is zoned accordingly and has all the necessary federal permits.